One of my goals for this month was baking and though I'm not sure if Irish potatoes are considered baking, I'm going to go ahead and consider them part of that goal. Growing up, my mom and I always loved coconut and I think my love for Irish potatoes stems from that. Coconut and cinnamon all rolled up (literally) into a a delicious ball of goodness...yes please. Beat butter and cream cheese together with electric mixer. Add sugar slowly (or end up with it all over the kitchen). Add vanilla and mix to combine. Add coconut in increments by hand until completely combined. 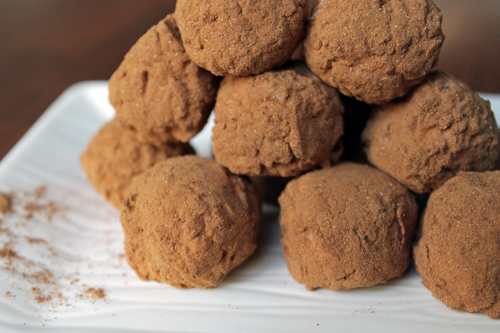 Taking large teaspoons of the coconut mixture, roll into a ball and then roll into cinnamon. Best if chilled overnight. Try not to eat the entire batch in one sitting. If you are looking to not make a ton of these (because you are worried about eating all of them), this is also a great recipe that tastes pretty much the same.